The Office of Legal Counsel (OLC) in the Department of Justice recently released a comprehensive 160-page memorandum it sent to the attorney general last August addressing the question of whether the Second Amendment secures an individual right. The memorandum concludes that the Second Amendment does indeed guarantee an individual Right to Keep and Bear Arms. While this conclusion may come as no surprise to gun owners, the public release of this memorandum is important because OLC opinions are extremely influential with courts and in the executive branch. In making this memorandum public, the Bush administration reaffirms the position taken by its first term attorney general, John Ashcroft, that the Second Amendment secures a right of individual citizens and is not a right belonging to the states, or a right restricted to those serving in militias or the National Guard. Understanding the importance and historical basis of this right should make courts and regulatory agencies more reluctant to interpret the right out of existence or burden its exercise with cumbersome regulations that even law enforcement agencies find confusing and difficult to enforce. Yet, even an official pronouncement from the Justice Department of the significance of the Second Amendment will not keep anti-gun municipalities, leftist-funded gun-ban groups and greedy trial lawyers from continuing their decade-old, well-coordinated campaign of frivolous, abusive lawsuits designed to bankrupt the firearm industry and render our rights useless. The first such case was Hamilton v. Accu-Tek, filed in 1995 in the Federal District Court for the Eastern District of New York. The plaintiffs were relatives of crime victims who claimed that firearms manufacturers should be liable in civil damages for those who had been killed or injured by criminals misusing guns obtained illegally through criminal channels. The conventional product liability legal theories offered by plaintiffs were dismissed before trial, but plaintiffs were allowed to proceed on a premise that handgun manufacturers were negligent in marketing and distributing their products. Plaintiffs claimed the manufacturers distributed handguns in a manner that created and encouraged an "illegal market for guns" and "enabled their criminal misuse," especially among youths. This theory, of course, is tantamount to claiming that General Motors should be liable in damages to a victim run down by a car stolen by an underage car thief because General Motors markets and distributes hundreds of thousands of cars into the marketplace in a way that encourages criminals (especially underage gang members) to steal them and engage in criminal acts causing injury to others, such as hit and run collisions, drive-by shootings and robbery getaways. In addition, even though the guns involved in most of the shootings were never recovered and could not be identified as to manufacturer, the district court in Hamilton allowed plaintiffs to use a legal theory known as "market share" to hold all defendants who manufactured the particular caliber of gun responsible for the criminal wrongdoing of a third party. The market share theory allows a percentage of liability to be assessed against a manufacturer on the basis of its proportionate share of the entire market for that product, even though there is no direct evidence that the particular manufacturer`s product was used to cause the injury. For example, in the Hamilton case, the bullets and cartridge casings from the crime scenes showed that in three of the incidents, each victim was shot with a 9mm handgun. There was no evidence as to who manufactured the particular guns used in each of the shootings, yet the trial judge allowed the case to proceed against all of the defendants who manufactured any 9mm handgun and to find liability based on the manufacturer`s share of the 9mm handgun market. After a four-week trial, the jury found that 15 of the 25 defendants had been negligent in marketing and distributing their handguns, and awarded more than $3.95 million in damages using the market share theory. The defendants appealed the judgment to the United States Court of Appeals for the Second Circuit. It is a rule of law that federal courts are required to apply the substantive law of the state in which the court sits. So the Second Circuit Court, unclear as to whether New York law permitted the theories of liability on which the jury based its verdict, sought clarification on two specific points of law from the New York Court of Appeals, the state`s highest court. The two points were: Whether the defendants owed plaintiffs a duty to exercise reasonable care in the marketing and distribution of the handguns they manufacture; and whether liability in this case may be apportioned on a market share basis, and if so, how? The New York Court of Appeals answered "no" to both questions under New York state law. The case went back to the Second Circuit which, applying New York law as pronounced by New York state`s highest court, vacated the federal district court judgment and dismissed the lawsuit. By inflicting a "death by a thousand cuts" to America`s firearms industry, they could drive all but the wealthiest manufacturers out of business. Those that are left will be forced to submit to oppressive "regulation"--like the deal forced upon Smith & Wesson under the Clinton administration--that will significantly increase the cost of firearms, while also greatly limiting the availability of guns to consumers. The Hamilton case lasted six years, consumed hundreds of thousands of hours of court time and cost the defendant firearms manufacturers millions of dollars in legal fees. This was the cost to defend against claims that were found by both the state`s highest court and the federal circuit court to be without legal or factual basis. The last words in the Second Circuit`s opinion tell the real reason for this lawsuit: "Each party shall bear its own costs." Since Hamilton, numerous similar lawsuits have been filed by the NAACP in Brooklyn, N.Y., on a public nuisance theory, and by the municipalities of Miami, Philadelphia, the District of Columbia and Chicago. 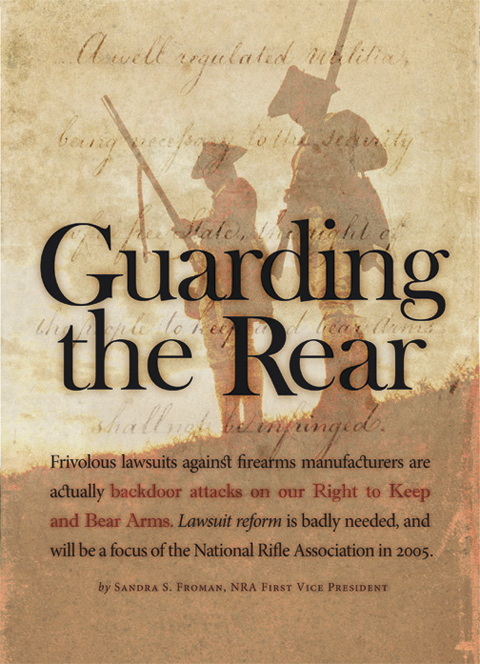 Even though 29 of the 33 lawsuits filed by municipalities against gun manufacturers and distributors have been dismissed, the back-breaking cost of defending the cases will continue to burden our nation`s federally regulated firearms industry as long as municipalities are allowed to use public tax monies to bring such suits. The good news is that 31 states have already passed some form of protection for gun manufacturers against municipal lawsuits. Still, federal legislation is badly needed. Stopping malicious lawsuits against gun manufacturers was a federal legislative priority for nra in the 108th Congress and will be renewed early in 2005. Last fall, Sen. Larry Craig, R-Idaho, introduced the Protection of Lawful Commerce in Arms Act, S. 1805. The bill would have prohibited civil liability lawsuits from being brought or continued against firearms and ammunition manufacturers, distributors, dealers or importers for damages resulting from the criminal misuse of their legal products by others. It would not, as anti-gun groups lied, have prevented plaintiffs with legitimate claims for defective products from bringing such claims. The bill was poised to pass the Senate last fall, and President Bush had indicated he would sign it. But the bill`s supporters had to kill it when opponents, led by Sen. John Kerry, D-Mass., tacked on a number of "poison-pill" amendments, including one that would have extended the Clinton gun ban, which later expired in mid-September. Without a federal law protecting the firearms industry against harassment lawsuits based on far-out legal theories, the industry will be forced to continue defending such claims in those states that have not enacted protective legislation. Since most of the major firearms manufacturers do business across the United States, it will be simple for the gun-ban groups and anti-gun trial lawyers to find plaintiffs and file lawsuits in states that have no such protective legislation and whose state law is less sympathetic to gun makers. As Dennis Henigan, attorney for the anti-gun Brady Campaign, pointed out, "What you really want is a diversity of cases in lots of different regions, lots of different courts to create a greatest threat of liability." Until federal legislation is passed protecting the gun industry, the more cases that are filed in those states that still permit such suits, the greater the risk is that one loss, even if it is a fluke, will open the door to a flood of new litigation. The opponent`s strategy is to pursue the same course of action that the plaintiffs did in the tobacco litigation where, despite losing case after case, they kept filing lawsuits. When a plaintiff finally won a case, it opened the floodgates, and the tobacco industry was eventually forced to pay massive settlements to avoid going out of business entirely. Under the American system of justice, which does not require a plaintiff who loses a tort action to pay the other party`s legal fees, there is no downside to municipalities or trial lawyers continuing to file such cases hoping to strike gold with just one case. In the meantime, these suits and the extension of tort liability theories are creating difficult insurance problems for gun manufacturers, wholesalers and dealers. Members of the industry are experiencing increases in insurance rates and, in some cases, even finding it difficult to obtain insurance. In some cases where a company has been sued and has tendered the lawsuit to its insurance company, the insurer has declined to defend the case or indemnify the gun maker on the grounds that claims based on a negligent marketing and distribution theory of liability are excluded from the coverage provided under the policy of insurance and courts in Massachusetts and Maryland have upheld the insurance company`s position. The recent increase in pro-gun majorities in both houses of Congress because of key election wins should make it easier to enact federal legislation protecting the firearms industry, especially in light of the Bush administration`s recently stated goal of accomplishing tort reform. But while most of the lawsuits filed against the firearms industry have been brought against specific named defendants, the prospect of municipalities and gun-ban groups filing defendant class actions against all firearms manufacturers, wholesalers and retailers nationwide is a frightening possibility that argues for acceleration of efforts to enact such tort reform not just for the firearms industry, but for all lawful business. Rule 23 of the Federal Rules of Civil Procedure expressly permits lawsuits against a class of defendants as well as the more common class action brought by a class of plaintiffs ("One or more members of a class may sue or be sued as representative parties on behalf of all . . ."). Under the rules, it is plaintiffs who get to select which defendants to name as representatives of the class. Their choice will be upheld so long as the representatives selected satisfy the requirements of the rule and "will fairly and adequately protect the interests of the class." It is up to the trial judge to determine in the first instance if the plaintiffs` choice of defendant representative will fairly and adequately protect the interests of the class. Let the firearms industry beware if such an action were ever to be brought in the courtroom of u.s. District Judge Jack Weinstein. Judge Weinstein was the trial court judge in the Hamilton case who allowed the plaintiffs to pursue the legal theory that was ultimately discredited by both the Second Circuit and the New York Court of Appeals. He is also the judge who heard the case of naacp v. Acusport, in which the naacp sued over 50 firearms manufacturers claiming, as did the plaintiffs in Hamilton, that the firearms industry places an oversupply of firearms into commerce knowing that such firearms will be used by criminals to commit illegal acts causing injury to victims of firearms violence. The naacp case is another case in which defendants ultimately prevailed, but only after years of litigation and millions of dollars in attorneys fees. Judge Weinstein is well known as an activist anti-gun judge. Atlanta product liability defense attorney Timothy Bumann, who has successfully defended numerous firearms businesses, considers Weinstein "a social activist judge" who "believes that he knows better than state legislatures and Congress and the atf what to do about the problem of firearms violence in America." According to National Shooting Sports Federation Attorney Lawrence Keane, "Judge Weinstein represents the tyranny of the judiciary . . . He is using his judicial office to further a political agenda that he is not constitutionally authorized to pursue." In the hands of judges like Weinstein, class action lawsuits could become the weapon of choice for the triumvirate of predatory trial lawyers, leftist gun-ban groups and anti-gun municipalities dedicated to achieving through activist courts what they could not accomplish through state or federal legislation. The ultimate goal of such groups is to make firearms inaccessible to ordinary Americans. It isn`t enough to stop the anti-gun politicians in the voting booth. We must also stop the anti-gun lawyers and their left-wing socialist financial backers by passing tough legal reforms that will protect America`s firearms industry. Without guns in the hands of peaceable, law-abiding Americans, the Second Amendment is but an historical relic, and the Justice Department`s conclusion that the Second Amendment protects an individual right would be meaningless to those who will be disarmed. Virginia Members! Contact Governor Warner And Urge Him To Sign Bills!